Celebrating the return of my movie projector (from service)with a piece of Japanese violence. My favourite Japanese badass girl, Meiko Kaji in a leading role! Quoting imdb: A wandering tough biker girl aids a female delinquent gang in their battles against an all-male Seiyu group over a fixed boxing match. A pounding soundtrack sets the tone throughout the movie, almost like a musical. It’s cool, it’s tough, it’s violent and it’s really ripping of the vibrant film-making happening in USA and Europe at the time. The plot is simple, and the characters weak, but it has a certain feeling to it anyway. 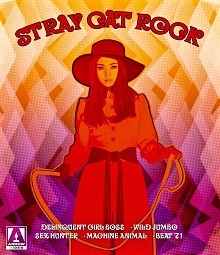 This is part of a boxset with movies in the Stray Cat Rock series, and I can’t wait to check out the rest of these crazy flicks.